Hello there, mommy to be! Listen we know you are super excited about this miraculous milestone in your life and just can’t wait to tell every single soul the “Good News”. checking your side profile in the mirror; midnight cravings for ice creams and not to forget those frequent trips to the loo. Brimming with a feeling of fear and excitement, isn’t it? And why you shouldn’t be? Pregnancy is undoubtedly a stunning phase of a woman’s life, however, it goes together with one’s own share of pain and struggles. And apart from all the happiness and the struggles pregnancy also brings along thousands of unsolicited advice. So if you too take the Google route and try to get the answer, then this is the right place you have landed on. As the pregnancy progresses from second to the third trimester, the woman starts putting on weight and the fetus starts growing exponentially in size. The growing uterus and baby cause the body’s center of gravity to move forward. Due to increased pressure on lower back muscles, a woman tends to lean or slump forward. Eventually, this weak alignment causes muscle tightness in the pectoral area, shoulder bending forward and increased stress on the muscles of the neck, shoulders, and mid-back. Physical therapy exercises increase physical endurance and muscle strength, particularly within the hips, back, and abdomen. These areas prepare the body for the event of delivering a baby. In order to treat these problem areas, physiotherapy teaches a range of programs like core stability, posture maintenance, flexibility, pelvic floor muscle training that not just keep the pain at bay but also prepare you to the birthing process by strengthening your abdominal muscles. If you notice symptoms like hand numbness, the sensation of pins and needles, hand clumsiness, hand pain at night, hand weakness, or wrist weakness it might be due to carpal tunnel syndrome. Pregnancy involves a huge hormone fluctuation. During pregnancy, there is a massive rise in blood volume which causes nerve compression. Since the wrist area is a little narrow it becomes difficult for the blood to circulate in these areas which causes sharp pain. 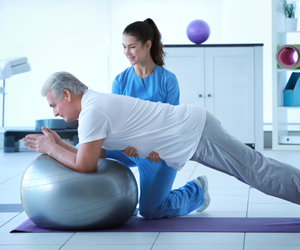 With physiotherapy, you can learn the correct exercises that help in pain management. The joint ligament program in physical therapy can be of great help to treat this issue. If you had an old wound or injury, for instance, knee pain or slipped disc it is highly likely that during pregnancy these issues might sprout again and turn grave. Under such circumstances, physical therapy comes to rescue. If you have a history of slipped disc it’s essential to consult an orthopedician and take his suggestions before you proceed to enroll for physiotherapy. Physiotherapist directed pelvic floor muscle training helps to prevent urinary incontinence during pregnancy and after delivery. Doing pelvic floor muscle exercises (Kegels) from early pregnancy onwards helps strengthen these muscles and prepare them for a smoother birthing. It also reduces post-partum discomfort from perineal swelling and hemorrhoids is lessened. It is important to understand that physical therapy is a medical treatment that involves massage, manipulation, heat medical care and exercise. It doesn’t embrace any sorts of medicines, drugs, and surgery which makes it an ideal approach to treat ailments throughout maternity and post birthing. The journey of pregnancy is the most beautiful yet challenging phase in every woman’s life. It’s crucial to plan wisely and choose the right antenatal care.